An estimated 60 percent of healthcare workers in the U.S. - or about 8 million people - have careers in the allied health professions. Every November a week is dedicated to celebrating their contributions. At UT Health San Antonio that recognition took the form of a packed schedule of special activities the week of Nov. 4-11. The signature kickoff event, a ladies' football tournament held Nov. 4, featured teams of female students cheered on by male students. Turnout exceeded expectations, said Amber Holt, a second-year occupational therapy student, and the tournament organizer. Students, their friends, and family attended the event, which also featured a cookout, live music and games. Four teams competed, including two from physical therapy, one from occupational therapy and one from physician assistant studies. The second-year PT team won first place, followed by the first-year PA in second place, MOT I/II in third place and the first-year team in fourth, Holt said. "It was so much fun to come together as Allied Health teams and have fellowship at a friendly tournament," she said. "The main point is to have a huge interprofessional intermingling." The week's activities included a photo and narrative display by allied health students on why they chose their profession. The goal of the display, on view in the dental and medical building, is to strengthen visibility and understanding among those in the nursing, medical, dental and allied health fields. 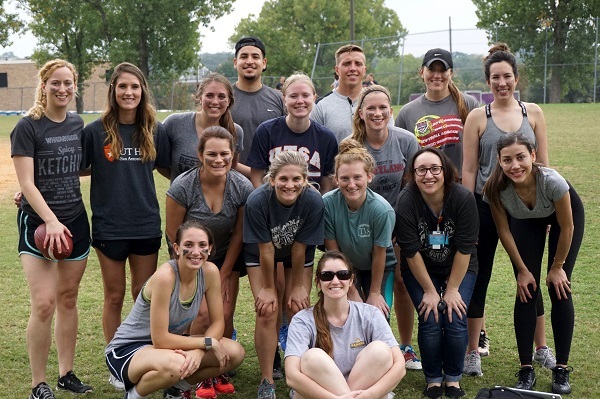 The Association of School of Allied Health Professions - Student Assembly (ASAHP-SA) campus chapter hosted the week. Other events included a sticker day, when all students of health professions received a custom- design sticker denoting their participation in allied health professions, a free breakfast, and coffee with information about ASAHP-SA, and a "Show Your Pride" day in which students were encouraged to wear allied health theme T-shirts. The week wrapped up with a health fair intended to showcase the different allied health professions.